AFM (Atomic Force Microscopy) is a powerful tool for imaging plant cell walls, to study their structure and the orientation of microfibrils. This type of analysis provides insights that are useful in the paper and pulp industry. Researchers at the Department of Biology and Center for Lignocellulose Structure and Formation at Penn State University have published a paper on this subject entitled “Spatial organisation of cellulose microfibrils and matrix polysaccharides in primary plant cell walls as imaged by multichannel atomic force microscopy”. AFM, together with complementary electron microscopy was used to characterise the nanoscale and mesoscale structure of the outer (periclinal) cell wall of onion scale epidermis. This is a model system for studying wall structure in relation to cell wall mechanics. The epidermal wall consists of around 100 lamellae, each approx. 40 nm thick. These contain 3.5-nm wide cellulose microfibrils oriented in a common direction within a lamella, varying by ~30 to 90° between adjacent lamellae. The wall has a crossed polylamellate structure, rather than being helicoidal. Montages of high resolution AFM images were taken of the newly deposited wall surface. 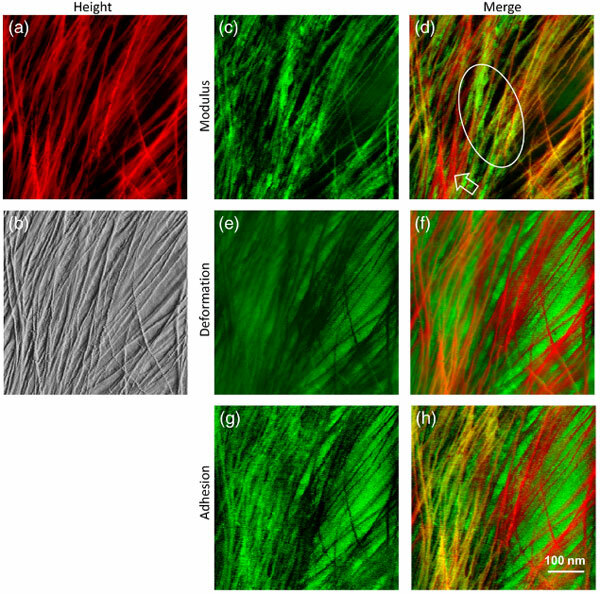 These showed that single microfibrils merge into and out of short regions of microfibril bundles, to create a reticulated network. Microfibril direction within a lamella did not change gradually or abruptly across the whole face of the cell; they were found to be consistent across the outer wall. Montage of high resolution AFM images showing extensive microfibril bundling. Microfibrils merge into and out of bundles, forming a reticulated network. A layer of pectin on the surface of the wall obscured the underlying cellulose microfibrils when imaged by FESEM. However with AFM they were visible. AFM was able to image through the soft matrix of the hydrated walls. AFM-based nanomechanical mapping revealed significant heterogeneity in cell wall stiffness and adhesiveness at the nanometre scale. Colour coding and combining maps hihglighted the spatial distribution of soft and rigid matrix polymers, in the context of the stiffer microfibrils. The results provide multi-scale structural information about the primary cell wall at close to native state, without chemical extraction or dehydration. This has implications for microfibril motions in different lamellae during uniaxial and biaxial extensions. Multi-channel AFM images showing the heterogeneity of cell wall polymer distribution: (a) Height image of onion epidermal walls. (b) PeakForce error image, (c) modulus map, (e) deformation map, and (g) adhesion map captured simultaneously of the same area. (d) Merged from (a) and (c). Hollow arrow heads point to the flexible microfibrils with low moduli. Ellipse indicates non-fibrillar rigid regions. (f) Merged from (a) and (e). (h) Merged from (a) and (g). The scientific paper by Penn State University is available to read in The Plant Journal, with full discussion of results and images. It’s currently available to read online for free.